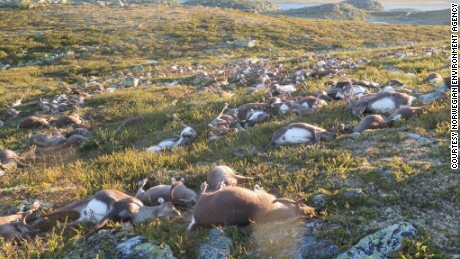 (CNN) More than 300 reindeer have been killed by a single lightning strike at a Norwegian national park. 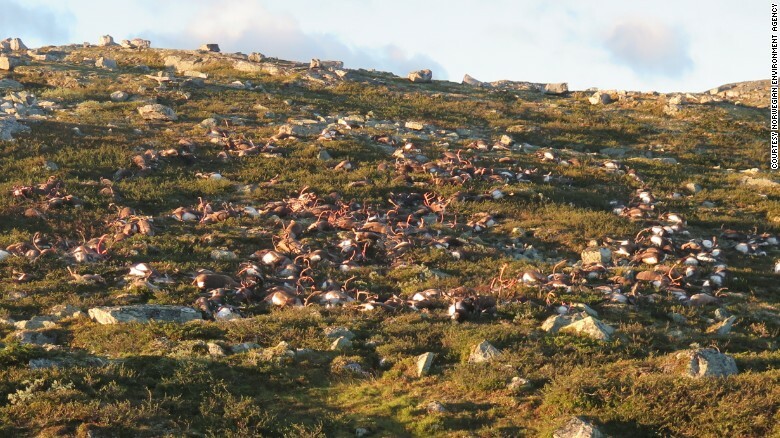 Pictures released by the Norwegian Environment Agency on Sunday show 323 carcasses scattered across a small, isolated area in Hardangervidda National Park. The plateau-like park in south-central Norway is home to Europe’s largest herds of wild reindeer, according to its website. One of the agency’s inspectors discovered the dead animals over the weekend after a storm passed through. Wild animals are occasionally struck by lightning, but the agency has never seen so many killed at once, spokesperson Kjartan Knutsen told CNN. “We have never experienced such numbers before. This is very large,” Knutsen said. He said the wild reindeer were huddled together because of heavy weather on Friday, when the strike occurred. “That’s why it’s possible for the lightning to kill so many,” he said. The Norwegian park is home to Europe’s largest herds of wild reindeer. Humans rarely visit the remote area. The dead reindeer were found by one of the agency’s inspectors because Norway is in the midst of its annual wild reindeer hunting season. Knutsen said five reindeer were still alive when the inspector came across the scene, but they had to be euthanized. He said the agency has now begun taking samples from the dead animals as part of a health survey. “We know they were killed by lightning, but this testing is for science,” he said. The dead reindeer were still on site Monday. While the agency usually does not remove animals when they die in the wild, it is currently considering other options because of the large numbers, Knutsen said. It’s not the first time a large herd of animals have been killed by lightning. In 2005, 68 cows were killed in Australia by a single bolt.